OCTOPUZ interviews Control Panels USA, an OCTOPUZ user and manufacturer of control panels and relay rack assemblies in Austin, Texas. 08/23/17, 12:18 PM | Industrial Robotics, Factory Automation | Dorner Mfg. Corp. The 2200 Series is designed to move small- to medium-sized parts efficiently and quickly. The conveyor line underwent a redesign just last year to make this product stronger, faster and more flexible. Advanced Aircraft Company (AAC) is now accepting deposits for Hercules UAS. Deliveries will begin December 2017. The Hercules is a unique long endurance multi-rotor UAS that incorporates two new technologies. The aircraft incorporates a series hybrid electric propulsion system and has patent-pending aerodynamic design improvements. This technology will make it possible to create extensive undersea data and communication wireless networks, solving many challenges for Navy and commercial customers. 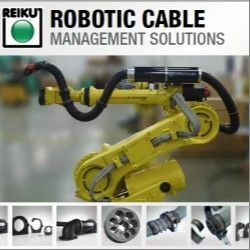 Kawasaki Robotics is your reliable international partner for intelligent automation production systems. Kawasaki has a wealth of expertise and products in industrial robotics, automation, and offers customized systems for your manufacturing processes in all three system environments. The new concrete 7th axis is inexpensive and sustainable and minimizes vibrations. Surgere's ROBi platform has successfully completed a full-scale pilot at a Dayton, Ohio, Tier-1 automotive supplier's distribution center and is ready for large-scale deployment.